My first nose job was performed by an otolaryngologist (otherwise known as an ear, nose, and throat doctor) who, in concert with my mother, encouraged me to have surgery. Without consulting me, my mother made an appointment and then convinced me to go with her—just to see what he had to say. He had operated on the nose of a neighbor, and my mother liked her result. Having a parent criticize a physical feature is a complicated emotional experience that induces both anger and guilt. You feel as though you have let the parent down. Why didn't you come out right? At the same time, the pervasive mythology of parent-child relations tells you that parents think their children are perfect, no matter what. From my mother's perspective, however, criticism of my nose didn't seem harmful because it wasn't permanent. Such problems could be resolved—fixed. Ballerina Allegra Kent writes about the nose job similarly imposed upon her by a mother invested in "conventional beauty" (79). "Allegra [said her mother], if you had a little more chin and a little less nose, you would be so much prettier" (78). And then: "Aren't you interested in a face that would be closer to perfect proportions? Then you would be beautiful" (78). When my friend Leslie had her nose fixed at age seventeen, that settled it. Leslie and I never spoke about her surgery, but somehow the mothers got together and conferred. Even though I couldn't see the difference myself following Leslie's surgery, my mother was more than enthusiastic. I suppose her postsurgical nose was slightly smaller. In those days, the only kinds of noses that made me think of surgery were very large noses. Slightly large (like Leslie's) or wide noses (like mine) or noses with bumps all seemed fine to my adolescent perception of faces. Young children and adolescents receive their body images wholly from the outside. The adolescent girl, especially, enters the world tentatively and waits for it to say yes or no to her face and body. Now that my face had emerged from its childish amorphousness, it was finished enough to predict its disadvantages. Negotiating adolescence can feel like traveling in a herd of sorts, always under fire or under threat of some dangerous predator; you hope that you will escape notice. Then one day you are singled out—shot down in the field—just when you imagined yourself safely swallowed in anonymity. My experience of learning there was something wrong with my nose is inscribed in my mind (and on my body) as a story of imperfection that "required" correction. The story goes this way: Your body is recalcitrant. It came out wrong. If you don't intervene on some level, you are compounding the original failure. A plastic surgeon I interviewed corrected my terminology: "It's not an intervention. I hate that word. Let's call it what it is. It's surgery." But psychically, it feels like an intervention in the body's wayward path. This holds true for both image-changing surgeries like rhinoplasty and rejuvenation surgeries like a face-lift. Your body is heading in a certain direction that threatens to make "you" worthless unless you rise up in resistance—unless you intervene. With surgery. It is important to remember that if you don't intervene now while there's still time, you will lose. Something. Everything. Love. Money. Achievement. This is what we learn even from the body-image scholars who write about how much easier it is to thrive in the world if one is good-looking. I worry about these supposedly objective studies, because I think they have the unfortunate effect of making us all more anxious than we already are. You! Yes, you there, because you are plain, you will be sentenced to ten years in prison instead of three. And you—don't even think about applying for that job until you have those jowls and double chin sucked smooth. We require streamlined faces to match our precision office spaces. Body-image studies become yet more fodder for plastic surgeons, who explain to me that men "need" to have their eyelids tucked in order to be considered young and energetic in business. The story of my household is like that of many Jewish American families whose assimilation is symbolized through physical appearance. Features, body styles—these have meaning. They tell stories all by themselves. Certain kinds of noses speak Jewishness. I have heard too many people say that he or she "looks" Jewish on the basis of the size of a nose. Jews assimilating into a largely gentile culture thus strip from our features the traces of our ethnicity. We have other aesthetically assimilating rituals. We straighten curly hair, dye dark hair light. We get very thin to disguise what we often imagine are Jewish-coded thighs and hips. What we choose to treat are precisely the features that are culturally selected as our distinguishing physical traits. My nose was not what my family would call "typically Jewish." It was wide. It was turned-up but "too wide," as my mother declared. Every picture of me would become an aesthetic catechism. "Do you know why this is a flattering picture? It's taken from the side so your nose looks good." There was that picture of me from my tenth-grade play. I was looking up at another actor, pointing my perfect gentile profile at them, concealing the disappointing full-face version. That picture became a kind of emblem—how good looking I could be if only I held myself in profile. Dr. Eileen Bradbury says of people self-conscious about their noses: "If you are concerned about your nose from the side view, then you will do everything you can to prevent other people from seeing it from the side. You develop a whole pattern of very anxious behavior that is intended to camouflage and conceal that part from the world" (Plastic Fantastic, "Horn of Plenty"). But, unlike the cultural fantasy of typical plastic surgery candidates, who walk around in a huddle of physical shame until one illuminating and determined moment they decide to take their bodies into their own hands and offer them up to some whiz of a plastic surgeon, I remained unselfconscious about a feature I considered perfectly acceptable. It was only after I became surgical that my features were reorganized into categories of pass and fail—a trail of sites viewed through surgical eyes. I had expected to reach my twenties with my body parts intact. This was not to be. When surgery enters your experience, the mirror becomes a kind of blueprint on which you project and plan the future of your body. This happened with my nose. At first, I looked at my nose and it looked fine. I couldn't really see the problem my mother had identified. It looked like "me." There is a difference between looking in the mirror and imagining what you will look like as a grown-up and picturing a surgical transformation. In contrast to the protracted process of development and aging, surgery feels like a kind of magic. When did cosmetic surgery become a common practice, the stuff of everyday conversation? 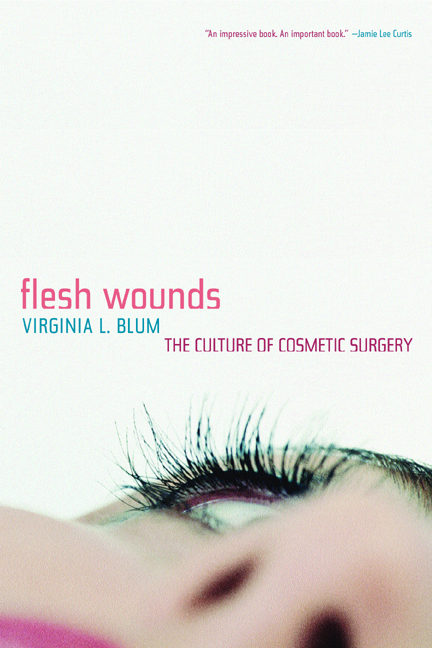 In a work that combines a provocative ethnography of plastic surgery and a penetrating analysis of beauty and feminism, Virginia L. Blum searches out the social conditions and imperatives that have made ours a culture of cosmetic surgery. From diverse viewpoints, ranging from cosmetic surgery patient to feminist cultural critic, she looks into the realities and fantasies that have made physical malleability an essential part of our modern-day identity. For a cultural practice to develop such a tenacious grip, Blum argues, it must be fed from multiple directions: some pragmatic, including the profit motive of surgeons and the increasing need to appear young on the job; some philosophical, such as the notion that a new body is something you can buy or that appearance changes your life. Flesh Wounds is an inquiry into the ideas and practices that have forged such a culture. Tying the boom in cosmetic surgery to a culture-wide trend toward celebrity, Blum explores our growing compulsion to emulate what remain for most of us two-dimensional icons. Moving between personal experiences and observations, interviews with patients and surgeons, and readings of literature and cultural moments, her book reveals the ways in which the practice of cosmetic surgery captures the condition of identity in contemporary culture. Virginia L. Blum is Professor of English at the University of Kentucky. She is the author of Hide and Seek: The Child Between Psychoanalysis and Fiction (1995).